accidentally microwaved my leftover pasta too long, which turned the sauce into scrambled eggs. damn. so I’m eating the top, and finishing off this blasted sleeve of Samoas that I couldn’t resist buying the other day. left them at work; otherwise they would have been gone the day I bought them. I utilized my lunch break to run to the post office, where I mailed THREEEE orders off!! two should have been mailed before today but because of all the ice, I didn’t actually get out of the house until yesterday. I should have mailed them yesterday…but, uh, that didn’t happen, so, you know. oh well. have I mentioned just how gratifying it is to be making money on these things??! I mean, it’s great!! I actually bought a case of bubble mailers and some tape today, because I keep needing them!! whoo hoo. so Saturday is going to be the 2 year anniversary of Matt’s death, which feels weird to say. I had a dream about him last night, which hasn’t happened in a looong time – I can’t remember when I dreamt about him last. these last 4 years have been so odd, and disjointed. this last year has been full of recovery and living. year before that I was covered in grief. year before that I was equal parts hopeful and frightened. year before that I was apprehensive and starting to be frightened. it’s been very strange, and ten years ago I would have never been able to guess what was in store for me. well, lost my train of thought thanks to blogging at work. oops. but I brought it up because I’m trying to decide what I want to do on Saturday. maybe I’ll buy a bottle of mead in honor of Matt. we’re supposed to get more snow on Friday so I don’t know about hiking — but if it’s warm enough and not raining/snowing, I might. I wonder how he would have wanted me to spend these February 21’s. I know that he would be happy with my life as it is right now, and proud of me. so it’s kind of a moot point, I guess. maybe I should see what Ryan’s doing. Well! It’s been an interesting weekend/week so far. The actual WEEKEND was great; we went to see Grand Budapest Hotel at the Belcourt on Friday, then went to the ballet on Saturday, and had dinner at the Old Spaghetti Factory (because we were at TPAC and I had a sudden craving for spaghetti and meatballs). Sunday we went to Fido in the morning, then to the Belcourt to see Wild (which made me want to immediately go backpacking), and then we went to a choral concert that afternoon. So pretty full and very good weekend. Stephen came over to my house on Sunday evening, and work ended up being closed on Monday because of all the ice we got, so we basically hung out at home. 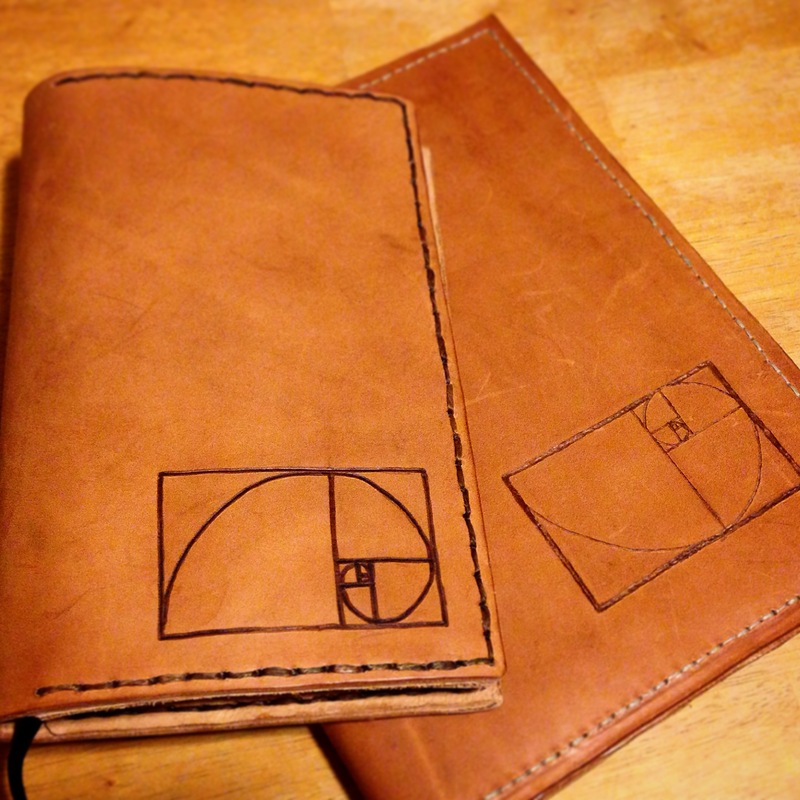 He read, I made this (top) Moleskine cover for myself, after being jealous of Stephen’s cover (bottom) the last couple of months. So pretty. I just love this golden ratio graph. Mm. Speaking of Etsy, things are going quite well. I’ve made 4 sales total, and have another person waiting on me to finish another apothecary’s satchel. 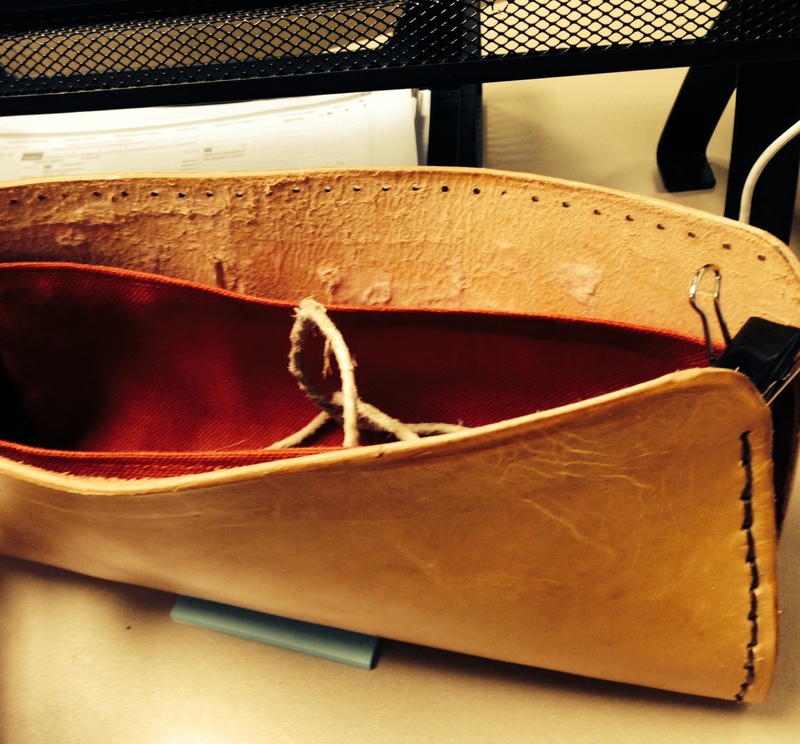 They also asked if I can make other leather things, like wrist guards. Will have to think about the answer to that question…………. Anyway, so yes. Very gratifying to be paid to make things. Sorry, picture isn’t the best. It was dark in the room but i didn’t want to use the flash. 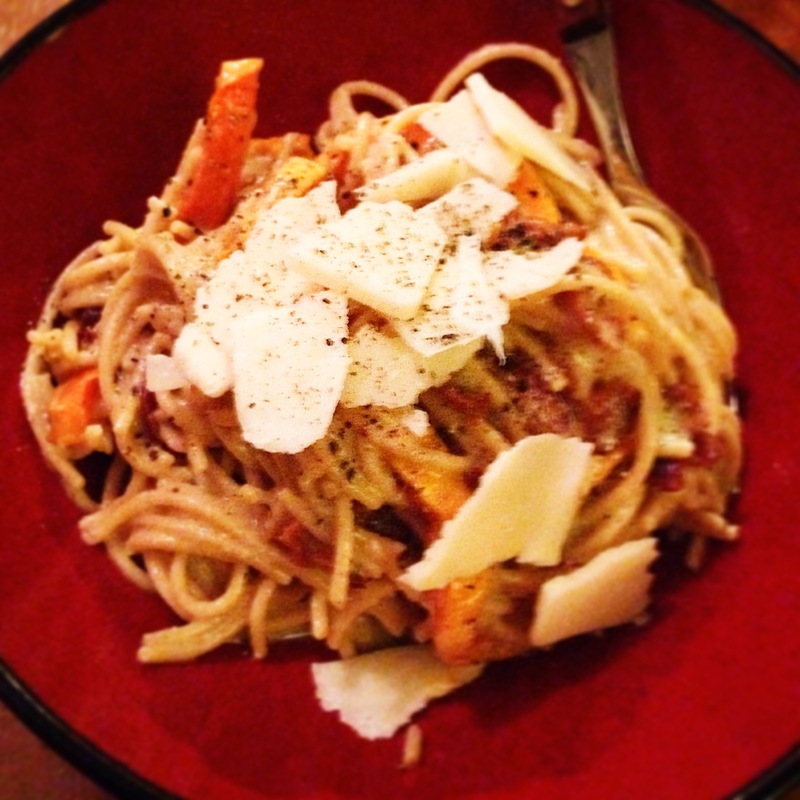 Anyway – I had never made a carbonara before, and it turned out pretty well! Instead of pancetta I used bacon, and instead of lemon zest I used grapefruit zest. Both worked perfectly. The sunset last night was really gorgeous. 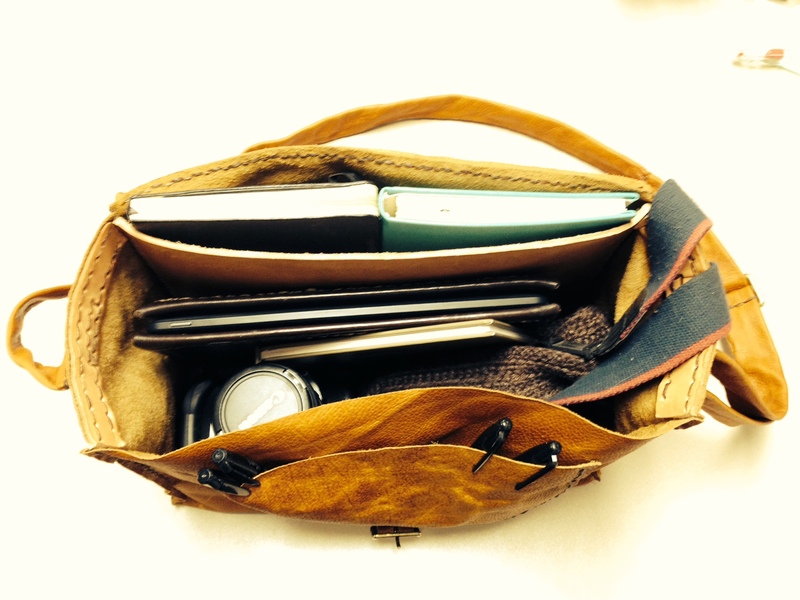 I know this is kind of a disorganized blog entry……..since I’m back at work today for the first time since last Friday, I keep getting distracted by phone calls. Just wanted to document my weekend somewhat, though. though, really, isn’t that what this blog has always been? I have listed 3 new pieces in the last 2 days, and one of them sold after being up for about 2 hours. 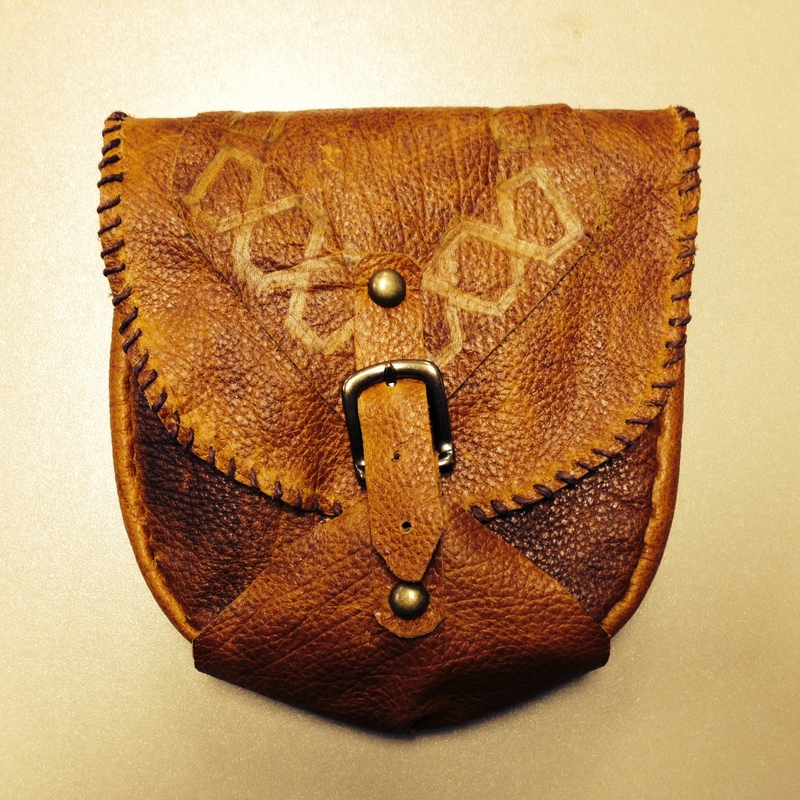 It was a Skyrim apothecary’s satchel that I’d made a few months ago and then rejected in disgust as it was rather off-center. See figure 1. 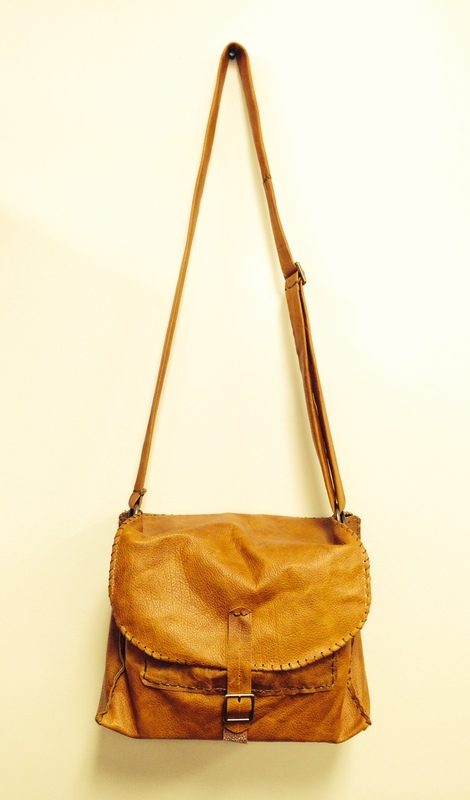 Anyway, I listed it for $20, which is apparently far too cheap for even an askew-apothecary’s satchel. 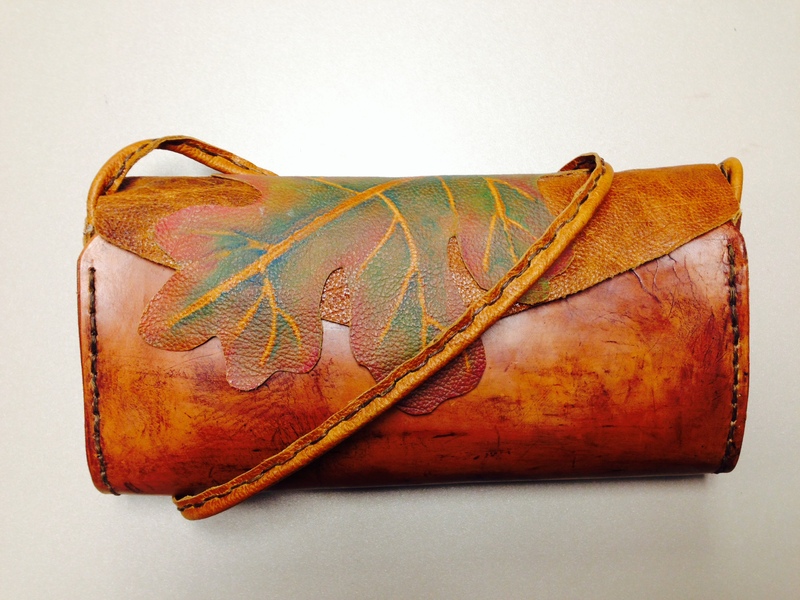 Other two items listed were oak leaf purses. One of them is significantly less expensive than the other, because I almost rejected it in disgust as well, after mucking up the dyeing job (fig. 2). Gah. I loved this purse and then had to go try to dye it. I had added oil to my leather dye because it was turning solid (BAD IDEA — will add alcohol if anything in the future) and it basically went on all splotchy, because of that and also because I didn’t apply with a wet rag. Oh well, live and learn. 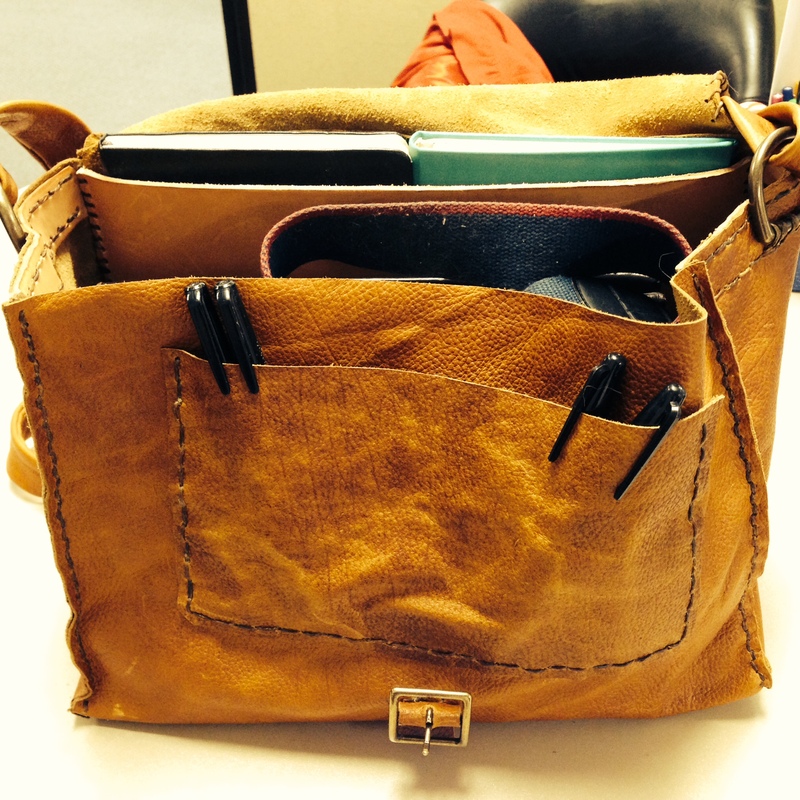 I made another similar bag last night, out of a thick veg tan that has a soft, suede-like surface (fig. 3). Very pretty. I sort of want to keep it. Might make myself one that’s larger and will hold a couple of books. Anyway, so yeah, there you have it. It’s been a tolerably good week so far, though I am awfully glad that it’s Friday. We’re going to see the Grand Budapest Hotel at the Belcourt tonight – I’m pretty sure that it might be the first Wes Anderson movie I’ve actually seen in a theater. (Unless — Anna Laura/Carla, did we see Darjeeling Limited together? or am I thinking of the Terminal?) Not sure what else will happen this weekend, other than sleeping in. It’s supposed to be partly cloudy/partly sunny all weekend, and cold, so possibly a hike…or possibly reading…or…..we’ll see. Am feeling pretty positive this Wednesday morning. Last night, I tried my hand at wet-molding leather; currently the experiment is nailed to an old cutting board and drying. It looks like it might turn out well, but we’ll see. I need some longer nails for this; all I could round up in the garage were little picture-hanging brads. Which are about as long as the width of my fingers, and that makes them rather difficult to hammer. At any rate, I did get a shape to form and stay, and if it turns out I’m sure I’ll post a picture. After that, I just started a new purse. The red lining inside is JUST too small, so I brought more material to work with me. I’m going to make sure to get all my actual work done before I start cutting a new lining, since I think one of the reasons I’ve felt kind of off lately is because I am not really trying my hardest at work. And I feel like I’m doing my work ethic a disservice. So as soon as I finish everything I can, and ask my boss(es) if I can help them with anything, I’ll work on this some more. Brought leather, too, so I can do a flap and a strap. I think this purse is going to look super cute once it’s finished. I’ve been seriously thinking about taking a really long weekend and dedicating it to reading. Does anyone know of a quiet, preferably secluded place that I/we could stay? Like, do any of you have a cabin in the woods that I could rent for cheap? Or an empty condo in a city that’s not Nashville? I really can’t afford to get a hotel or B&B or anything. Sadly. I’m almost leaning towards going to Knoxville and maybe camping in the Smokies one night, or something. It’s a tad cold for that right now, I know….. Still in the brainstorming stage, but I think that getting away for several days and focusing on reading would be so good for my soul. I’m having lots of benevolent and hopeful feelings today, and am feeling unphased by depressing news on FB. Which is odd, but awesome. May it last all day and into the future! If I had a mimosa, I’d toast myself. Another day at work! I’m not sure why, but I’m feeling better and more alert than I was yesterday, which is always nice. Less nice is the fact that I keep thinking today is Wednesday, but I’ll get over that. Last night we made breakfast for dinner (biscuits, sausage, and scrambled eggs w/ shallots and spinach and cream cheese) and ate while watching Groundhog Day (what else?). Was a good evening. We were both wiped out for God knows why, but I think I’m the only one who got any sleep. I do still have bags under my eyes this morning, though. Will continue ignoring the mirror. Alternatively, could start wearing makeup. Hm. I’m ALMOST done with Cold Mountain. I was one page before the epilogue last night when Stephen walked in the door, and had to put it down. I’m nervous about finishing it though; I very much suspect that it’s not going to end the way I want it to end. Such is life, I suppose. And I appreciate books that don’t allow you to foster naive expectations of reality. But on the other hand, is it too much to ask for Inman and Ada and Ruby to all be happy together, tending their gardens and orchard and chickens and goats and the like? Grumble. Just ordered some veg tan that’s cheaper than Tandy Leather’s – but it’s from an online company and I’m slightly nervous about not being able to actually touch and feel the leather before buying it. Oh well….how bad can it be? I’ll let you know. I have been wanting to make more projects using this thick type of leather (as opposed to the stuff that’s more upholstery/garment weight) but was running out. Not that you care. But. Stephen has to do some final edits on an essay tonight, and I’m not sure if he’ll be finished when I get off work (doubt it), which means that when I get home I’ll need to really try hard not to play too much Skyrim instead of cleaning the kitchen or starting a new project. I mean, if I just paid over $100 for a side of leather, I need to be able to make that back at least. Have made back the money I spent on that whole cow I bought a few weeks ago, but not really much more, so I do need to buckle down. Could probably churn out some small projects pretty quickly, actually. 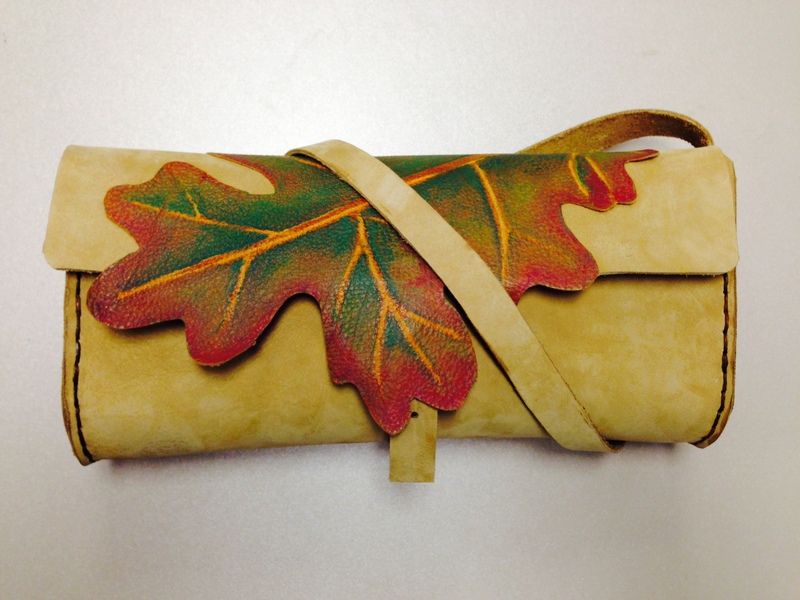 Hm, maybe I’ll draw up some templates for that stuff today — like the clutch I gave Rosa for Christmas, for example. Yeah, good idea. 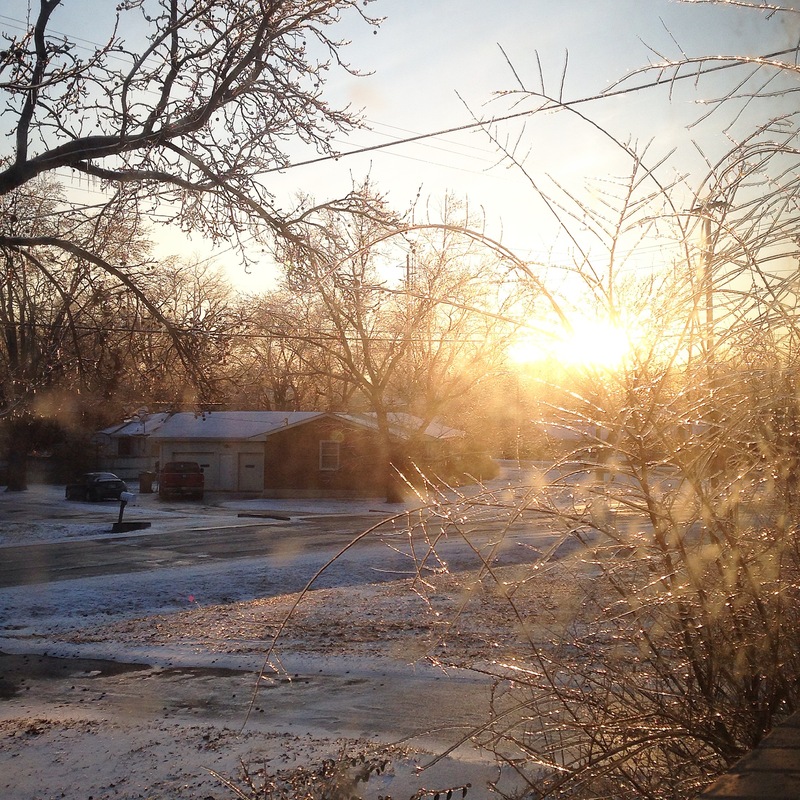 OK, another blog entry successfully helps me direct my plans for the day — yay for writing! Just finished this camera bag. Kinda want to keep it.